In my research I discovered this unusual tidbit—the caterpillar has been implicated in “Mare Reproductive Loss Syndrome (MRLS), but how the caterpillar triggers abortion in horses has yet to be determined. 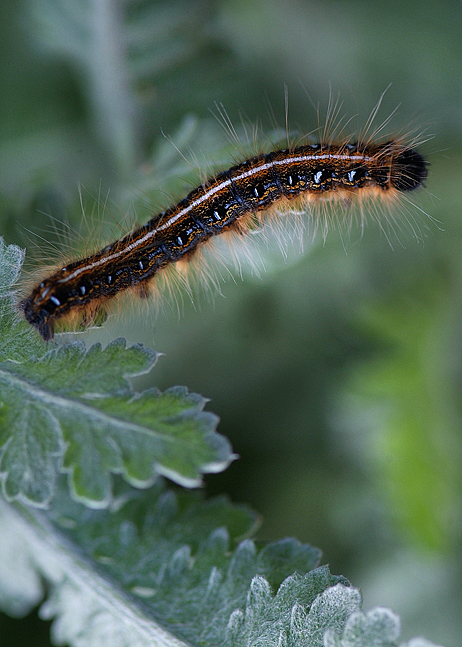 In the spring of 2001, Kentucky experienced an unusually heavy infestation of Eastern tent caterpillars and their presence has been linked to MRLS. 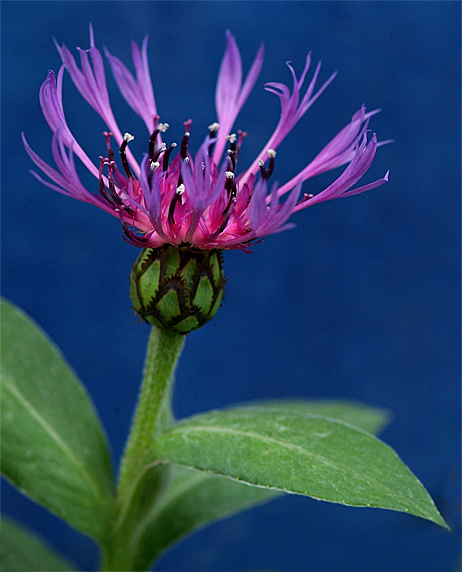 Bottom photo: Perennial Cornflower or Mountain Bluet (Centaurea montana) against a blue glazed pot background. It is a perennial form of Bachelor’s Button and blooms late spring to midsummer. It self-seeds and prefers moist soil in sun or partial shade, and can be divided in the fall. My dear friend Karen’s mother passed away March 26. With monetary contributions from her fellow Weedettes in the Runnymeade Garden Club and Supper Club friends (thanks, everyone! ), I suggested that she and I start a memory garden to honor her mother. Her mother loved gardening, too. The highlight of the garden would be the heart-shaped stepping stone Sue and I purchased for her at McDonald’s Nursery in Virginia Beach a few weekends ago. It was such a perfect sentiment for this garden (even though whoever typeset it put an apostrophe in “its,” when it was possessive and not a contraction…and one sentence is missing a period (okay, so this is a peeve of mine, as you may have noticed). We bought it anyway because it was so fitting, despite these annoying (to me, at least) errors. Karen and I went shopping this past Sunday morning from 10:30-1:00, hitting Home Depot and Campbell & Ferrara Nursery (http://www.campbellferrara.com/) for loads of plants. Karen kept worrying that I was overspending and I told her to just enjoy the ride. How often do you get to shop for plants and someone else pays for it? Relax, girl! I also told her that since her birthday is April 30 (tomorrow! ), any “overage” would be my birthday gift to her! 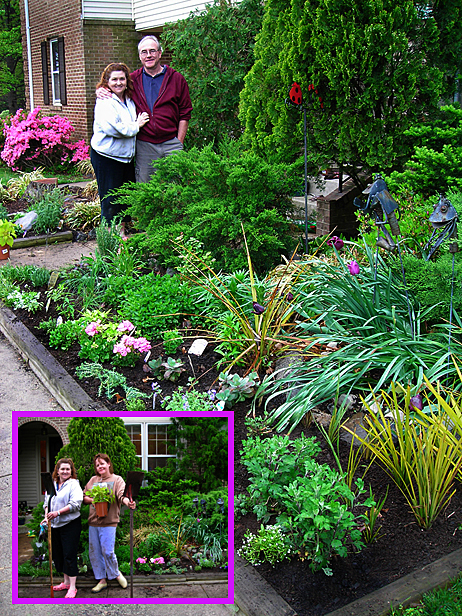 Our primary focus was perennials, but we threw in some colorful annual flowers and herbs, too. Her garden already had good “bones,” with nice foundation plants, grasses, and a few bulb plants (tulips and irises), and mums. We added purple, yellow, and white coneflower; a shasta daisy, yellow yarrow, purple salvia, catmint, four sedums (upright and creeping), yellow tickseed, and loads of herbs (rosemary, variegated sage, chives, sweet and purple basil, lemon thyme, and a lavender plant. For instant color, we added white allysum, hot pink impatiens, deep purple wave petunias, and two lime green sweet potato vines. We planted two colorful coleus (one of her favorites) in the shade under a foundation plant. She also picked out two cucumber plants to grow in pots on the front step. After lunch at Macaroni Grill, we headed home and from 3:00 to 8:00, we moved existing plants around, redesigned the garden, and put in all those plants. We didn’t even stop when it started sprinkling! (You can just imagine how lovely we looked, covered in mud and mist!). Husband Joe/Clifton came home just in time to be assigned the task of dragging a rather large bag of garden soil around. He also cleaned up the mess we made on the sidewalk (thanks, Joe/Cliff)! I’ll record the garden’s progress throughout the growing season, of course. Thank you to everyone for helping make Karen’s little memorial garden possible. We love you, Weedette Karen (and Joe/Cliff). And the happiest of birthdays tomorrow, red-headed woman! My ‘Purple Sensation’ alliums are beginning to bloom. I did some research (of course) and discovered there are nearly 400 ornamental allium species! Allium is a member of the same family as garlic, onions and chives. 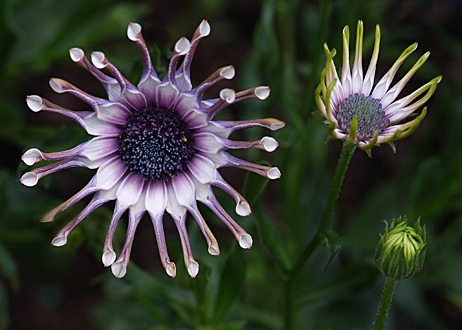 These sun-loving blooms look like a cluster of lollipops when you plant them en masse. They’re one of my favorite things to grow. These May-blooming alliums come back every year and are about 20-30 inches tall. They’re also fun to photograph in their various stages of bloom, from the ready-to-burst sheaths to full flower to past-their-peak. At the last stage, they resemble koosh balls (and feel springy like them, too!). 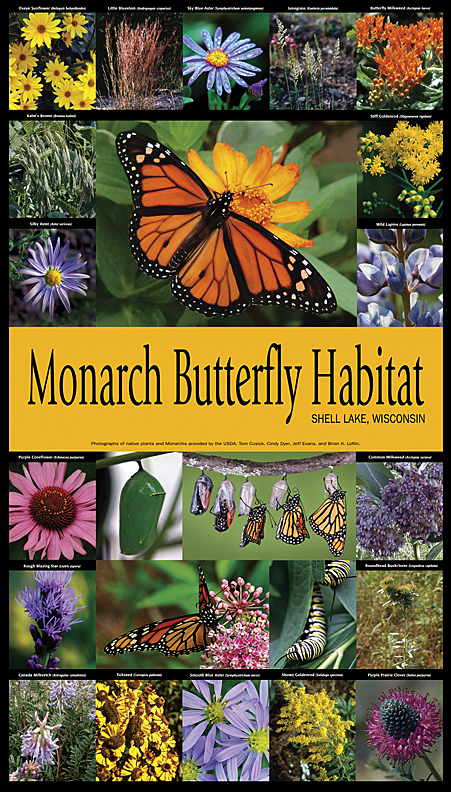 I recently designed this sample poster for Happy Tonics to use as an educational tool to show what native plants will be grown in the Monarch Butterfly Sanctuary that is being developed in Shell Lake, Wisconsin (http://www.shelllakeonline.com/). You can learn more about Mary Ellen, Happy Tonics, and the Monarch Butterfly Habitat at http://www.happytonics.org/. In addition to utilizing photos from my own archives, other images were provided by Happy Tonics, Jeff Evans (http://evansimagesandart.com), and Brian Loflin (http://www.loflin-images.com/). This morning Michael and Carmen and I headed to Lewis Ginter Botanical Garden in Richmond (http://www.lewisginter.org/) to see the “million blooms.” The weather was perfect and although it was a little windy (tulips waving in the breeze are a wonderful sight! ), I still managed to get some good photos in between gusts of wind. As I suspected she would, Carmen fell in love with their amazing garden gift shop. I’ve been to a lot of garden gift shops and Lewis Ginter outshines them all! They have a wide assortment of garden sculptures, fountains, art, knick-knacks, aprons, hats, t-shirts, scarves, umbrellas, benches, gazebos, trellises, stakes, seeds, plant markers, tools, a great selection of books and instrumental garden music CDs, containers of all kinds, gorgeous garden-themed jewelry, home decor (plates/vases/teapots & cups), and lots of things for kids. We shopped as soon as we got to the garden, then went out to photograph, had lunch, photographed some more, then came back and shopped again. These are some plant “portraits” I shot there today.